Shalemstead is a small town of 3,500 people along the eastern bank of the Isdmir River. The town is growing due to its proximity to the Elves of Valor’s Forest. The Elves do not allow any non-fairy creature to stay in the forest, so they must find shelter in the Human settlement nearby or camp in the much less hospitable outdoors. Many of the citizens of Shalemstead have grown to rely on this tourism and their reputation for hospitality is well known throughout Cimmeria. Shalemstead is self-sufficient and requires a lot of farmers to provide for its own citizens as well as the many tourist and trade caravans that pass through on the way to meet the Valor’s Forest Elves. The necessary professions in town are monopolized by guilds that are controlled by the descendants of the original settlers of Shalemstead. The guilds are named after their founding family member. All the blacksmiths belong to the Boris guild, all the innkeepers belong to the Shord guild, all the wainwrights belong to the Tama guild, etc. The town’s government is solely composed of the guild leaders. This council of elders meets every three months to make important decisions for Shalemstead. They contribute all the funds for any necessary expenses such as paying guards, maintaining roads, or building bridges. These funds are in turn collected through guild dues, tariffs, and the personal profits that the guild leaders make on their own operations in town. Many years ago the Shalemstead was attacked by a cabal of vampires. A fire started during the attack and dozens of people were injured or killed. The town’s only cleric at the time, George, also perished in the attack, but the small shrine he had built remained untouched by the flames. As the town has grown a new and larger temple was built. Regardless, many of the townsfolk continue to pay homage to the gods at this small shrine in George’s honor. Shalemstead has joined the Second Alliance to fight the Xorians. 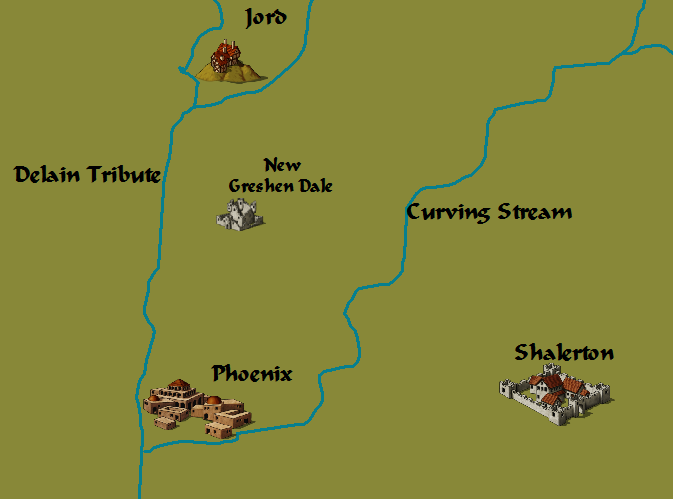 The town cannot contribute much in the way of manpower, but their trade connections with the Elves have proved valuable. Dorrowsan is a city with about 30,000 people living it. The city is a single structure made entirely out of magical ice. The ice doesn’t melt despite high ambient temperatures and does not chip when attacked with a non-magical weapon. It does melt when an everlasting torch is put next to it, even though such a torch is just an illusory flame that produces no heat. The fortress’s temperature is a comfortable 72˚F (22˚C) with a slight wind in larger rooms. Sunlight penetrates the walls illuminating every room, hall, and passageway, but one cannot see through the ice into other rooms. Food, furniture, and items can be produced at will if the person doing so is in a calm state of mind. In combat a Concentration check is required of DC 15+how many rounds the combat has lasted. The created things all have a look similar to the ice and will melt if taken from the fortress. Obviously such a paradise would attract many people, but the city is run like a mystical cult with many odd organizational principles and rituals. The societal classes are split into colors with White being on the bottom going through Red, Orange, Yellow, Green, Blue, and Purple to the highest Black. To get into the city you must give up your possessions and wear a robe according to your color. If you wish to have your items returned you are given a tattoo that signifies that you are never to enter the city again. One is upgraded from each color for doing something considered exceptional for their current ranking and downgraded for doing something dishonorable. The society’s rules are vaguely Japanese in structure. The different ranks don’t have any significant responsibilities as the fortress provides enough that no real work is needed. Each rank simply has a level of control over lower ranks. Hence if a Yellow wanted a Red to help him make a table with their minds then the Red would have to help or risk demotion. Dorrowsan exports a few magical items in exchange for commodities that can’t be produced by the fortress. The imports are mostly good food and other luxuries such as blankets that the fortress is incapable of making from ice. An odd thing happens in Dorrowsan at sunrise that seriously disturbs foreigners. All of the people wake up, go outside of the fortress, and stand in what would look like a military parade. They then simultaneously empty their bowels and pee. The excrement is quickly burned by the people before they retreat to the fortress. This is done every day in silence and when mentioned to the residents of the city the event is always denied. The leader of the city is titled The Great Lump. Prior to the events of the Second Alliance War, The Great Lump was a fire giant priest named Chirrigar. The people of Dorrowsan, instead of being unnerved by the identity of their ruler were honored to have such a wise and strong protector. The ice in the Dorrowsan shrank and retreated to accommodate space for whatever he did. Chirrigar’s scepter gave him this power and allowed him to see through the walls. The scpeter counts as a +4 Flaming Burst Mace. The scepter can also be used to control the people in the city who wear the robes or have the tattoos, but only when the sun shines its brightest, sunrise. He maintained the morning ritual as a cruel joke upon his subjects. Chirrigar was walking through the desert after his tribe had been wiped out by a Blue Dragon when he found the scepter. He went to the Dragon’s cave and slew it, taking its hoard he spread the word to humans of his new city he had seen in a divine vision. He went to the site of the city northwest of the desert and planted a large piece of quartz he had found in the Dragon’s cave. It grew and grew and took on the shape that Dorrowsan has today. Dorrowsan initially joined the Xorians in the Second Alliance War. Chirrigar used the scepter to physically move the icy city towards Dalleer. Upon reaching the city he challenged the Alliance to single combat. The Alliance would send forth a champion to fight the Great Lump. The winner would gain control of both Dalleer and Dorrowsan. Hektor of Lakatia represented the Alliance and defeated Chirrigar by beheading him. The scepter that controlled the city was given to Kig Yupington. He moved the city east to Jipangu to train with other new recruits to the Alliance. I read a few webcomics and one of my favorites is called Order of the Stick. There are different genres of webcomics just like any other medium. My favorite genre combination happen to be humorous comics about video games or D&D written by physicists or computer scientists. Anyways, Order of the Stick fits pretty well into that genre. 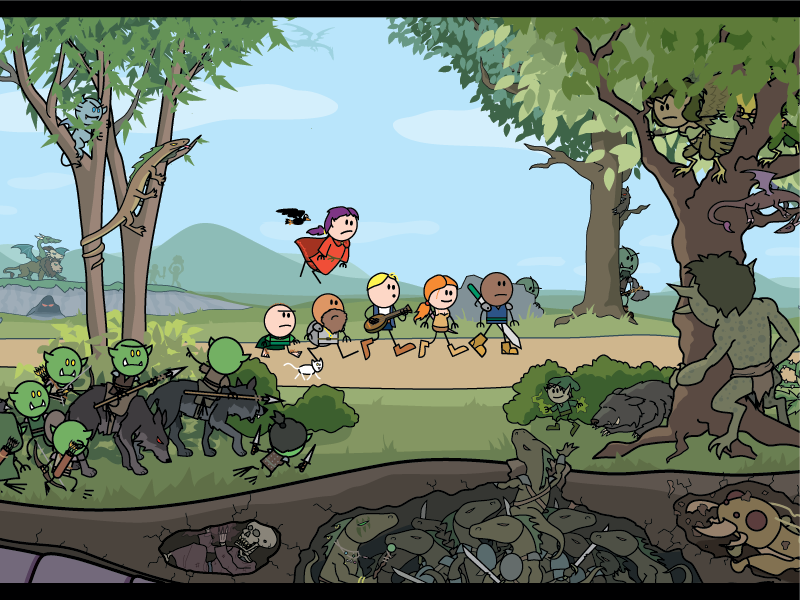 Order of the Stick is drawn and written by Rich Burlew, a game designer who now does the comic full time. The comic is about a band of adventurers named the Order of the Stick fighting the evil lich, Xykon. As you can see the comic is drawn in a fairly simple style which is occasionally lampooned by the characters themselves. For example, Roy’s feet are different sizes and there is a comic where he talks about how his big shoe goes on his left foot. Speaking of Roy, the main characters of Order of the Stick! Roy is the black guy on the far right of the picture above. He is the leader of the Order of the Stick, an intelligent and principled fighter who fights Xykon due to an oath sworn by his father. Next is Haley, a rogue with a complicated past. She joined the Order of the Stick to earn money to pay her father’s ransom. She’s stayed on due to the good work the group does and because she’s started dating the next person in line. Elan is the blond guy playing the musical instrument. He is hyper aware of storytelling tropes. He also has an evil twin, a good mother, and an evil father. Elan is a bit dumb when it comes to anything that isn’t a storytelling device, but he has a pure heart. Durkon is the short bearded guy. He’s a dwarven cleric. He looks out for everyone else in the party. He has a strong sense of honor and is always ready and willing to do the right thing. The short bald guy behind Durkon is Belkar. He’s an evil halfling psychopath. His journey with the party is basically a form of community service for murders he’s committed in the past. You’d think this is weird, but its a fairly common gimmick used in D&D. The cat walking next to the party belongs to Belkar and is named Mr. Scruffy. Flying above the party is Vaarsuvius, an elven wizard. Vaarsuvius is arrogant and uses magical power to cruelly avenge the slightest insult. Vaarsuvius’ gender is never revealed in the comic and is joked about on a few occasions. Xykon is close to achieving his goal of using an ancient evil to rule the world, but the Order of the Stick is ready to stop him. Of more concern is Xykon’s assistant, Redcloak, who is planning on double crossing Xykon at any moment. That’s enough on one comic for now! There’s a few words that get tossed around a lot in D&D. 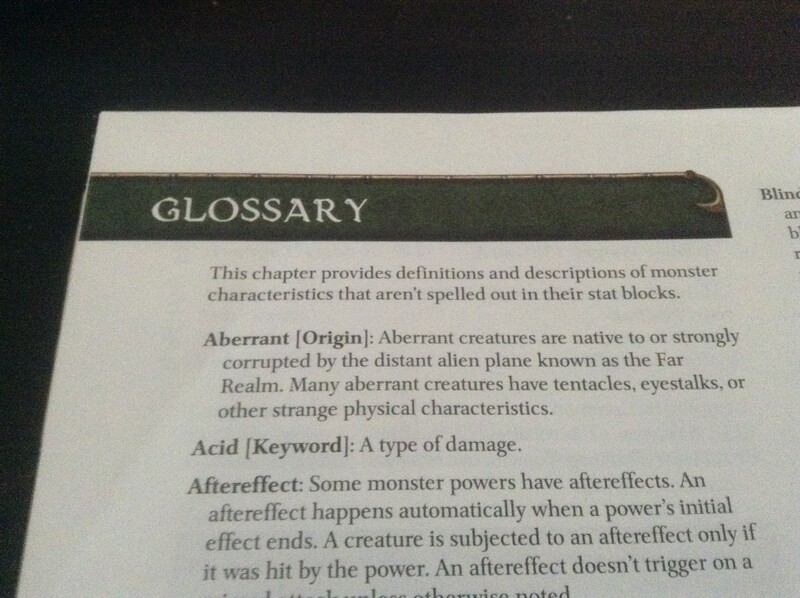 I often forget that other people don’t know the specific D&D meanings of those words, so I thought I’d provide a short glossary of terms today. The first word that I realized others might not know was teleport. None of the auto-spellcheckers I have used ever recognize teleport as a correctly spelled word (And now I’ve confirmed that WordPress’s spellchecker doesn’t catch it either). Teleport is a word that means to instantly appear somewhere else. The transporter in Star Trek and apparating in Harry Potter are essentially both teleporting. The act of teleporting is called teleportation. Campaign: A series of adventures that the players undertake, often with an underlying theme. My players are in a campaign where they fight a vampiric empire. The campaign before that was an attempt to prevent the establishment of the vampiric empire (they failed in the end). Prior to that they were fighting an evil death wizard (or necromancer since this is the blog post to teach you these words). Campaign World: The main fantasy world in which a campaign takes place. My campaign world is based off Greek and Roman mythology and takes place in a place far to the east that the Greeks called Cimmeria. Plane: There are often other worlds connected to the campaign world. These alternate dimensions are called planes. 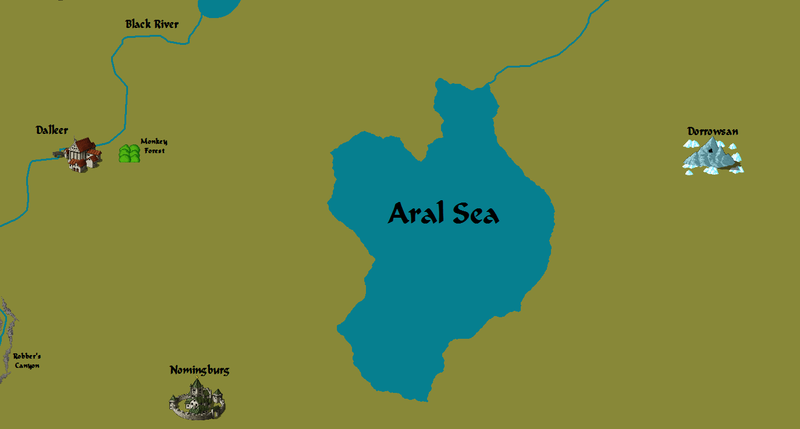 They appear as pools in some of the prequels to the Narnia series. The other worlds could be parallel dimensions or versions of heaven or hell, or anything else you can think of. Cleric: A cleric is a person who devotes their life to religion. In English we often associate specific words with specific religions. A minister is Christian, a rabbi is Jewish, an iman is Muslim, etc. To avoid that confusion, D&D uses cleric to refer to priests of all gods and religions. Encounter: A single conflict between the players and an adversary represented by the DM. These conflicts are often violent, but they don’t need to be. A diplomatic negotiation could also be an encounter. Adventure: A string of encounters that have a unifying villain or objective. Adventures are composed of encounters and campaigns are composed of adventures. Campaigns can also have overarching villains and objectives, but the individual villains in each adventure will often change. You fight the henchmen before you fight the villain (Deatheaters before Voldemort in Harry Potter). Experience: When the players defeat an encounter their characters are awarded experience points (EXP or XP). These are used to make their character stronger. They’re an important extrinsic reward in the game. A character’s power is defined by how much XP they have. If a character is more powerful then they can take on greater challenges. A hero could start off slaying orcs, gaining more experience til he is slaying giants and dragons. Level: As characters gain more experience they increase in level. Each level has a set amount of XP required to reach it. Thus power increases in a stepwise fashion. More and more XP is needed for the higher levels. D&D levels typically range from 1-20. System: D&D is the most well known pen and paper roleplaying game, but its not the only one. Many others exist and most have their own acronyms as well. Generic Universal RolePlaying System (GURPS) favors realism over the fantastical heroism of D&D. Call of Cthulu (CoC) simulates the Lovecraftian horror genre instead of high fantasy. Star Wars is for science fiction and World of Darkness (WoD) is for playing in a world of vampires and werewolves. D&D is the flagship of roleplaying games, but it probably has less than half the overall market share within the business. The rules of D&D and the rules of all its competitors are called roleplaying systems. Edition: All these roleplaying systems have different editions. D&D is about to release its 5th edition. I believe GURPS is on its 4th now. WoD is on its 2nd edition. My friends and I started off playing 2nd edition D&D and switched to 3.0 and then 3.5 when they came out. We became entrenched in 3.5 and never switched to 4th edition (4E) and are only considering it now. This unwillingness to change leads to what are called edition wars in D&D. Different groups will argue that their system or edition is far superior to any other. It’s a snobbish elitism that exists in any hobby from beer drinking to bird watching. Class: A character in D&D must pick a class to decide what powers they have access to. Wizards can cast powerful spells, but can’t fight very well. Fighters can swing a sword, but they can’t sneak into buildings. Rogues can sneak around and lie to people convincingly, but they can’t heal wounds. Clerics can heal wounds and cast some of the weaker spells, but not the more powerful ones. The wizard, fighter, rogue, and cleric make up the 4 basic class types in D&D. Each character must be one of these classes or a variation on them. Each level a character has is in one of these classes. A character could have all of their levels in one class or spread them out as much as they like between the many variations on the basic four. Race: Players pick a race or species when they first create their character. The basic races are human, elf, dwarf, halfling, half-orc, gnome, and half-elf, but there are many more. Each race gives a character a few small bonuses and penalties along with a set of typical physical features to choose from and a racial history to assist in writing a character’s backstory. Skills: Characters have a few things they are good at. This could be something like cooking, playing an instrument, climbing, or using magical items. Most if not all roleplaying systems have skills. Feats: Feats give a character additional options or bonuses beyond what their race, class, and skills give. A character gets one feat every three levels. Feats are unique to D&D. A feat could be something like the ability to create magic items, running for long distances without tiring, or using one weapon much better than any other. That’s enough for now! With this info you’ll be able to understand my future posts on D&D a little better.